Adding a little color to your world can dramatically change the appearance of your landscape. 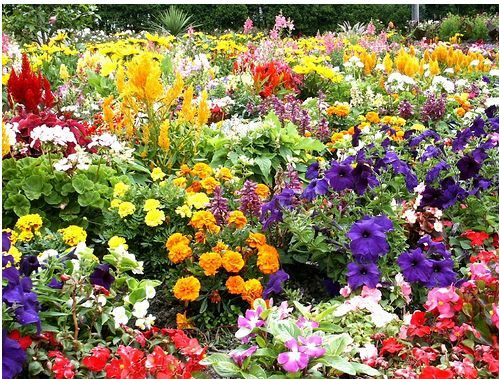 Experiment – try something different in each area of your yard – a nice mixture of bright colors, shades of all the same color (monochromatic) or a wide variety of many shades and hues. The options are many and the choice is yours. It can whisper quietly in the background, softly playing on our moods and emotions, or it can shout out loudly, demanding our attention. Color’s power to move us is unmistakable. The brilliant pinks and tangerines of a summer sunset, or the shimmering blues and silvers of a wintry landscape, can stop us in our tracks, causing us to pause for a few precious, quiet moments in an otherwise hectic day. In a similar way, color in the garden has the power to set a mood every time we step outdoors. You can liven up your life by introducing new and exciting colors into your landscape. Scatter a little yellow in an established border, plant a vibrant red in a window box, line a path with vivid blue, or discover the unexpected pleasures of an all-white garden. We’ve selected some of our favorite colored blooms to help get you started. Cheery yellow catches the eye and lightens the mood. Add sunshine with coreopsis, daffodils, erysimum (wallflower), helianthus (sunflower), hemerocallis (daylily), Ligularia ‘The Rocket’, primrose, rudbeckia, ranunculus, snapdragon, solidago (goldenrod),tulips,pansies and violas. These fiery colors are perfect for dressing up outdoor living areas, as they stimulate conversation and appetites. Some sizzling stunners: alcea (hollyhock), ilex (winterberry), kniphofia (red-hot poker), monarda (bee balm), papaver (Oriental poppy), pelargonium (geraniums), peonies, roses, salvia, snapdragon, tulips, and zinnias. Calm and refreshing, the colors in this family lend a cooling note to even full-sun locations. Relaxing shades to try: ageratum, aster, campanula, centaurea (bachelor’s buttons), delphinium, echinops (globe thistle), forget-me-nots, hydrangea, iris, lavender, lilac, muscari (grape hyacinth), perovskia (Russian sage), primrose, salvia, scabiosa, veronica, violas, and wisteria. A soothing color to create spaces both restful and romantic. Perfect pinks: astilbe, campanula, cosmos, dianthus, dicentra (bleeding heart), echinacea purpurea (purple coneflower), impatiens, Lilium ‘Stargazer’, peonies, petunias, phlox, and roses. Provides a visual break from other hues and lends a clean and tidy feeling to the garden. Wonders in white: alyssum, caladium, clematis, cosmos, daisies, delphinium, gypsophila (baby’s breath), hydrangea paniculata, iberis (candytuft), iris, Lilium ‘Casablanca’, platycodon (balloon flower), snapdragon, and zantedeschia (calla lily). We’re here to help with any suggestions for the perfect plants for your outdoor space. Stop in or give us a call – Bayview Nurseries & Garden Center – 609-641-0648.